Today, I'd like to go over some of the ingredients to avoid while pregnant. Since over 60% of what we apply to our skin gets absorbed into our bloodstream, what expectant moms use is really very important. I remember being concerned about what to eat (or not to eat) while I was pregnant. As much as I love soft cheeses and coffee, I eliminated them from my diet from the get go. I was careful about skin care, but there is just so much more info these days. As wonderful as essential oils are, some really need to be avoided while pregnant. As someone who studied aromatherapy extensively, this can be a tricky subject because there ARE so many benefits of essential oils, but there still is research out there suggesting many should be avoided, so I woul err on the side of caution, especially during the crucial first trimester. Here is a great link from the National Association of Holistic Aromatherapists. They, in fact, recommend avoiding all essential oils during the first trimester and I do agree with this. Neem Oil -- Neem has been shown to cause damage to the forming kidneys of babies in the womb. 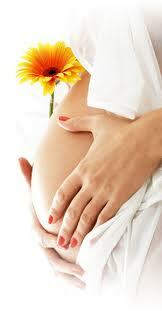 Tea Tree Oil -- In pregnancy, this has been linked to hormonal issues and abnormal development in boys. Oxybenzone -- This is found in many different sunscreens. In pregnancy, this ingredient has been shown to cause hormonal issues. Nanoparticles -- The more and more I study nanoparticle technology, the more concerned I become. There needs to be more regulation of this one. In pregnancy, I recommend that you err on the side of caution. In a 2011 study, research revealed that nanoparticles caused pregnancy complications in mice. (source). These are found in titanium dioxide and zinc oxide--opt for pressed powder makeups over loose. Nanoparticles in loose minerals are much easier to inhale and have dispersed in the air. You will also find nanoparticles in some sunscreens. Salicylic Acid -- Also called BHA or beta hydroxy acid, this is a wonderful oil soluble ingredient to get deep into the pores, help ease inflammation and for the treatment of acne-- unless you are pregnant. Since this ingredient is in the aspirin family, it needs to be avoided. Phthalates are often components of artificial fragrances and in many nail polishes. Look for DBP or dibutyl phathalate on the label. Unfortuntately, this is not legally required on labels when it is in fragrance. Avoid artificial fragrances. Formaldehyde Releasers -- Look on your labels for DMDM hydantoin, diazolidinyl urea, imidazolidinyl urea, methenamine, and quaternium-15. These all release formaldehyde. These have been linked to cancer, as well as having neurotoxic effects. The worst thing you can do -- get a Brazilian Blowout. These contain around 10% formaldehyde and are carcinogenic. No one should get one of these, especially pregnant women. Formaldehyde is a KNOWN carcinogen--in other words, it has been proven to cause cancer. It is not worth the chance to you or your unborn baby. In the September 1, 2011 edition of Carcinogenesis, researchers at the California Pacific Medical Center released their findings showing that both BPA and Methylparaben at even low concentrations found in humans have negative health consequences such as an increased breast cancer risk. It also went on to mention the ever-increasing male breast cancer rate, which is another alarming trend. These findings are quite similar to an older study on parabens from about 10 years ago. In this compelling study in the Journal of Applied Toxicology, parabens were linked to breast cancer as they have shown to be hormone disruptive and lead to tumor growth. Being pregnant is a wonderful journey. Don't stress over the little things. Enjoy it -- and be healthy.